I write about this because I think it probably happens more than people realize. Autism is not the “r” word (retarded or mentally/developmentally inferior), but many people still feel and believe that way. In fact, you may have read an earlier post from last April where I encountered this type of attitude from a stranger. Yesterday I encountered it from someone I know. I can tell you, that was way, way worse. Now, almost 24 hours after the incident (and after apologies) it still hurts in a way I can’t describe. It feels as if all the air has been taken out of my lungs, as if I have had a heavy blow to my gut. The words, “You’re retarded,” hit me like a wall. I could only stand there, stunned, hurt beyond belief as the realization struck me that this was how that person really viewed me, how they truly felt because I have Asperger’s. I wanted to curl up in a ball right there and retreat from the world, but instead I just walked away without saying a word. I wanted to keep walking, but I had nowhere to go. Something was changed in that moment, with the utterance of those words. A light came on, I guess you could say. I realized that people hide how they truly feel or they shove it in the back of their mind. I understood, somewhat, the concept of political correctness. This person had been “politically correct” with me for quite some time, but in one moment, the veil slipped and the truth came out, political correctness abandoned. Things will never be the same, they can’t be. Once you know how someone truly views you, good or bad, you can’t go back. I think the saying “ignorance is bliss” is very true. I think I would have rather not known this bit of information because the truth hurts too much. This person said that they were upset and that is why they called me that. They said they did not mean it. But why say things you don’t mean? Isn’t that lying? I don’t know this person to lie and it certainly didn’t seem like a lie but more deliberate as if the words were carefully chosen and spoken from the heart (even with the upset tone). I know that at least in that moment that person truly felt I was that way and I have to believe that somewhere inside them they still do. I don’t think opinions that strong can just come and go so easily. Maybe it is too buried, too deep, for them to recognize it under normal circumstances, but when the time is right, the environment is right, the deep-seated opinions and feeling bubble up to the surface and it is revealed or at least recognized. But just because you recognize it doesn’t mean that you have to convey it. I knew other people felt this way about me, but I never thought this person would. And it still hurts in unimaginable ways. I don’t like it when things change and this changed everything. This has altered how I trust this person, how I relate to them, how I feel about them. I wish I could go far, far away. But running away never solved anything. I just have to deal with it and be more careful when I deal with this person in the future. I have to limit how much I let this person into my life and how close I get to them. I can keep my distance; remain separate so they can’t hurt me again. I forgive them. After all, you can’t hold it against someone for how they feel and for speaking the truth. You can’t crucify them for their own opinions, even if it hurts. But it doesn’t mean that I have to put myself in a position where they can hurt me again. 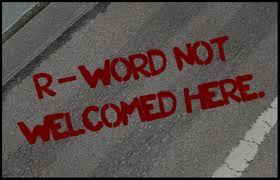 I really don’t want to be too close to someone who thinks I am inferior or thinks I am the “r” word. I really don’t want to be too close to someone who calls me names. I really don’t want to be too close to someone who discourages me and tears me down. I feel that people, for the most part, tolerate me, my Asperger’s. I only have a very small number of people who I feel accept me for who I am. This person was among that small number. Now I have to question the attitudes of the others in that group. I feel even more separated from society, more isolated, more different, more of an outcast. If I don’t fit in with this person, this group, I don’t fit in anywhere. I do have to wonder, though, does God see me this way too? I thought differently before, but this person is a very godly person, very close to God, and they see me this way. I have to assume that that attitude is a reflection of God’s attitude toward me. I am sure He appreciates that I am a willing, obedient vessel, but He can still see me as something less than human, something inferior, an idiot, if you will. But I guess God can use idiots just like He uses anyone else. I don’t know. I will still remain faithful to Him. This incident, though, has made me rethink some things. My whole world has been called into question now at the utterance of a word. And I know it is just a word, but it had great impact, great meaning and it changed so much in my life. It altered my relationship with the person who said it and everything now is different. I write this because maybe, just maybe, you will think before you speak. Take care your words, for they cannot be unheard.